Protest against UCL Outsourcing! | Bloomsbury Fightback! On 20 May, Bloomsbury Fightback! continued the campaign against UCL’s proposal to outsource low-paid maintenance workers, most of whom are black, with a lunchtime banner drop in the main quad. The event took place beneath the university’s new art installation—an assortment of metallic pennants that represents some kind of fish. Though it faced stiff competition from Bloomsbury Fightback!’s own, more artisanal “No Outsourcing” banner, this stylishly glittering artwork is a pertinent adornment at a time when UCL management is struggling like a slithering trout to deflect charges of hypocrisy and institutional racism: management’s “Bloomsbury Masterplan” professes a commitment to staff welfare while glossing over the havoc outsourcing will wreak on low-paid staff’s terms and conditions. The protest and leafleting were undertaken by twenty of Bloomsbury Fightback!’s growing local network of activists. 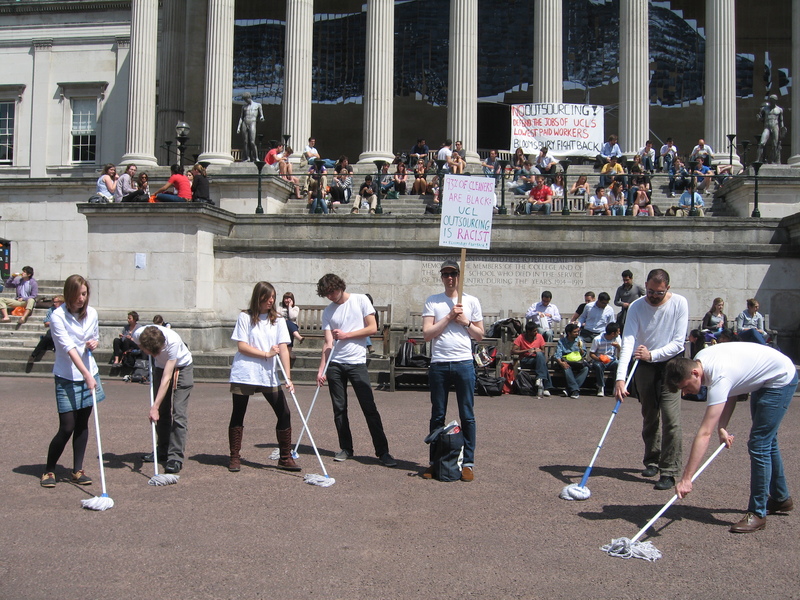 Mops were carried to draw attention to the fact that 65 of the 94 targeted staff are cleaners. It is likely that many of the staff and students eating sandwiches in the quad while avidly observing the protest were struck by the balletic grace the participants brought to the performance. And they were not the only ones. The activists then moved enthusiastically around the university site, bringing the message to the corridors, café, and refectory, and even paying an impromptu visit to Provost Malcolm Grant’s office. 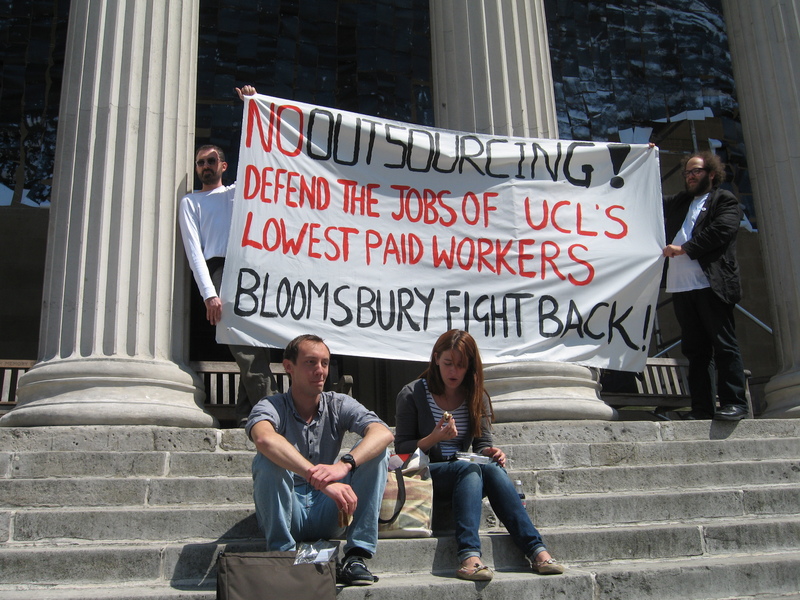 Bloomsbury Fightback!’s campaign continues next week with a demonstration in the UCL main quad on Thursday 26 May at 1.00pm. Come and join in! If the outsourcing proposal is not stopped, the best symbol of UCL management’s approach to staff welfare will be not a shiny fish but a gangmaster’s lash!